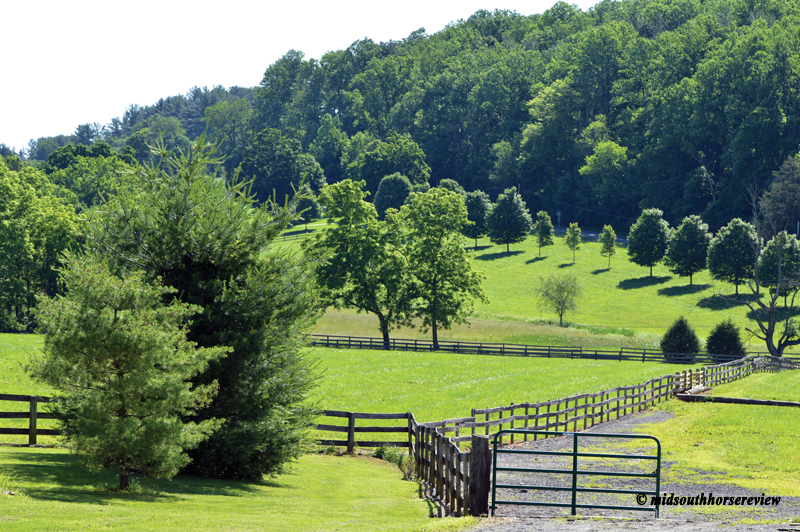 Just north of the very urban and suburban Baltimore area lies rolling farm land with lush green pastures and plenty of horses: Hunt Valley, Maryland. Very similar to the Blue Grass Region at Lexington, Kentucky, this scenic area is known for quality Thoroughbred race and steeplechase horses. 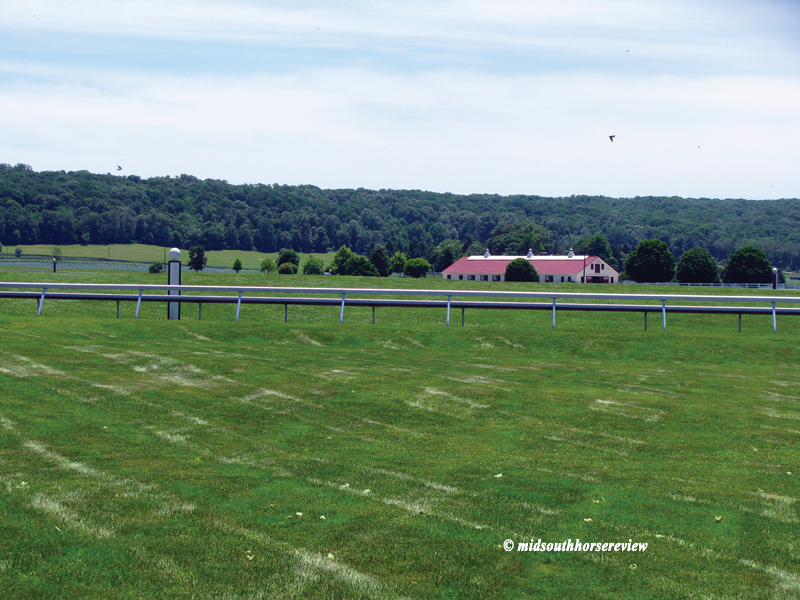 The limestone in the soil, with ground water close to the surface, makes nutritious forage for the area’s Thoroughbred horses, and the farms provide plenty of green pastures for their steeds-in-care. 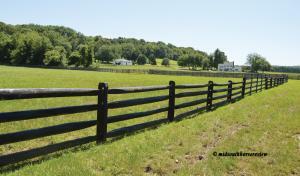 The pastures are fenced with the traditional four-board wood fence, with rolling, wooded hills in the background. 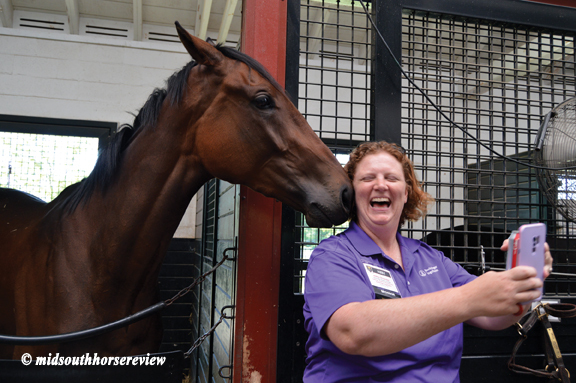 American Horse Publications (AHP), an association of equine media professionals and related businesses, of which The Mid-South Horse Review is a member, held its annual equine media conference June 14-17 in Hunt Valley. As a treat prior to the three-day intensive conference, the AHP arranged a Horses, Hounds, and Hilltops Tour to four prominent horse (and hound) farms in the Hunt Valley area. 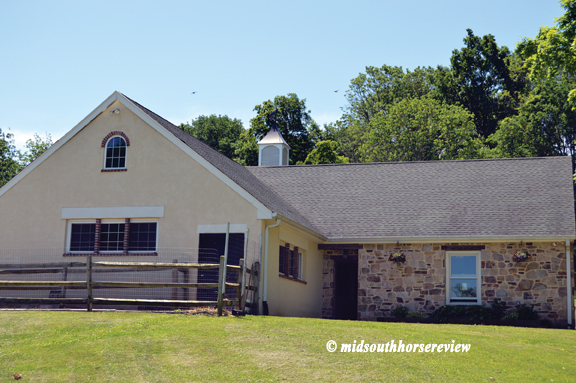 Tour guide, Barrie Reightler, with the Mid-Atlantic Thoroughbred, brought her own expertise to that of the prominent people at the farms on the tour to provide a thorough account of horses, racing, and land preservation in the Maryland Horse Country. Hunt Valley is the site of the famous steeplechase race – the Maryland Hunt Cup, established in 1894 and run on the last Saturday in April over the same course built in 1922 in Worthington Valley. The race started as a rivalry between riders in the two foxhunting clubs in the area – the Elkridge Fox Hunting Club and the Green Spring Fox Hunting Club – over who had the best foxhunting horse. The four-mile race, with 22 solid timber fences, is considered one of the most difficult steeplechase courses in the world. The sizes of the fences are particularly daunting, with the third fence (four feet, six inches) and the sixteenth fence (four feet, ten inches) two of the toughest. 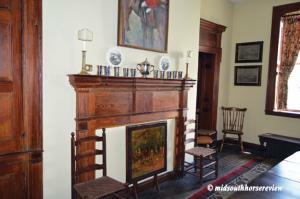 The jumps, posts and rails, are all hand hewn locust tree wood, which is very hard and durable. Going back to colonial times almost all of the fencing in the area was made of locust posts and chestnut rails. But American Chestnut trees, which were once plentiful, were killed off by blight in the 1920s. Spectators come for a day’s outing of picnicking and tailgating and park on the hillside near the start and finish of the course. It is one of the few courses that can be viewed almost in its entirety from this hillside. Two famous horses that have run in and won this race were Mountain Dew and Jay Trump. For several years in the 1960s, the two horses rivaled each other, either winning or placing second. Jay Trump won the race three times, as did Mountain Dew. In addition, Jay Trump won the English Grand National in 1965 and Mountain Dew won six Grand National Point to Points (1962, 1963, 0965, 1966, 1967, and 1968). Joe explained the importance of looking at a horse’s ears to know where his attention is focused. If the horse’s ears are back, his attention is on the rider. But if his ears are forward, his attention is on what’s in front of him. 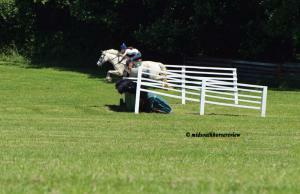 Joe and his wife emphasized NOT rating the horse’s stride before a fence, as one would do on a jumper course. Galloping in the open toward these very solid fences, it’s best to let the horse adjust his stride on his own. “He sees the fence and he jumps it perfectly every time,” Joe told 60 Minutes and us. 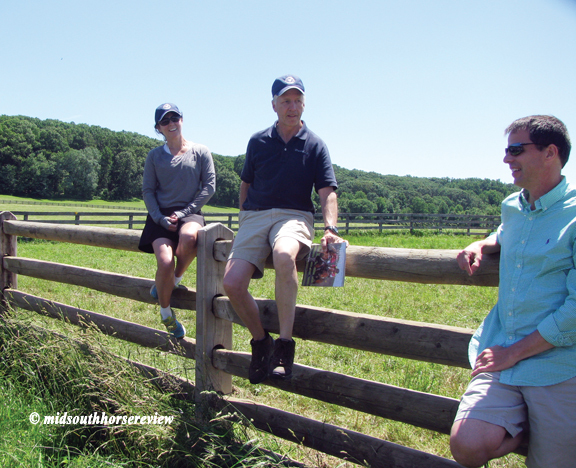 Tour members had the opportunity to walk half the course (2 miles), with Joe and Blythe Davies describing how to ride each fence. Many readers will recognize the name Jack Fisher, one of the leading trainers of steeplechase horses who usually has several entries at the Iroquois Steeplechase every year. He trained Eclipse Award winner Scorpiancer, winner of the 2017 Calvin Houghland Iroquois, and 2017 leading earner Mr. Hot Stuff. Fisher was awarded his sixth Leading Trainer Award by the National Steeplechase Association in January 2018, and Mr. Hot Stuff won the Lonesome Glory Award as 2017’s leading earner. 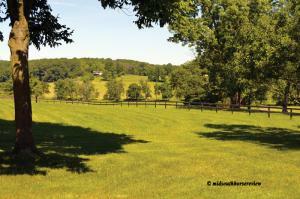 Fisher’s Locust Hill Farm is also nestled in the area’s green, rolling hills. 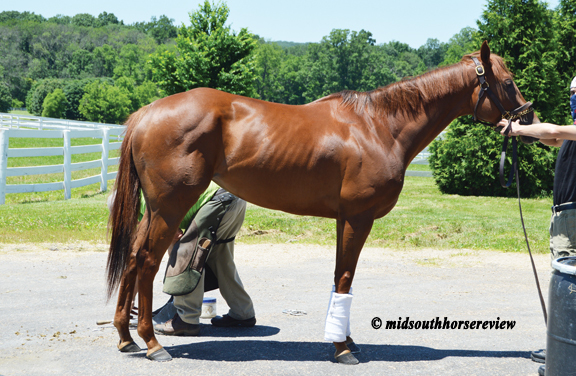 The hills work well for the steeplechase tracks he maintains, and he has mowed courses for several training levels. 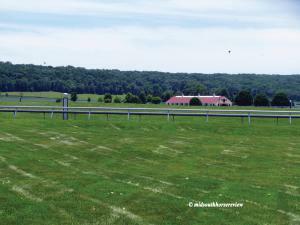 The 370-acre Locust Hill Farm was formerly owned by Stuart Symington Janney, Jr., one of Maryland’s most prominent Thoroughbred owners and breeders, who died in an auto accident in 1988. 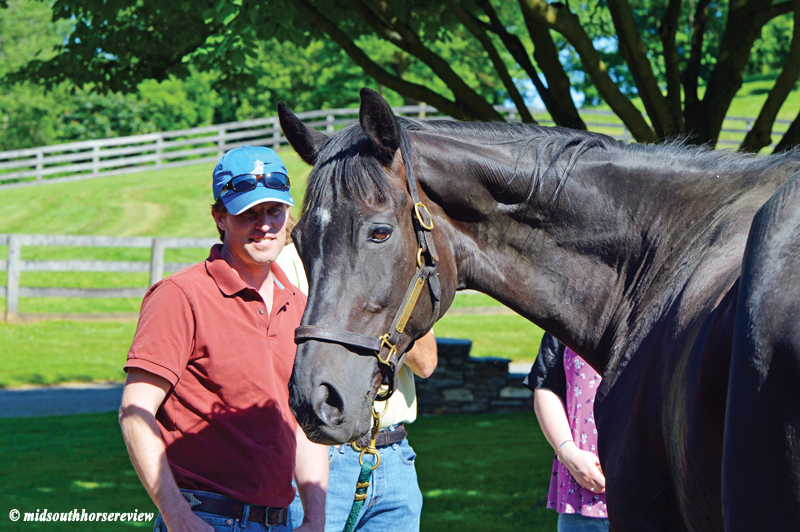 Janney was the owner of the famous champion Thoroughbred mare Ruffian. Fisher is a fourth-generation horseman and it is obvious he loves his vocation. He described several of his top horses and how he trains steeplechase horses, beginning with riding them down trails in the woods with obstacles, such as fallen logs, across the path. The horse has no choice but to jump the obstacles, as the path is too narrow to go around them; so this teaches the horse that jumping obstacles is a natural way to go forward along the trail and also teaches them to develop their own pacing for the jump. Next come galloping over roll-tops (without the brush) to ultimately galloping over the brush steeplechase fences in a steady rhythm. Sean Clancy (brother of Joe Clancy), a former champion jockey who rode for Fisher and is now a writer, editor and publisher of The Steeplechase Times, joined Fisher to explain about the horses, steeplechase training, and riding. In some humorous moments, Clancy talked about how Fisher gets along with his jockeys. He said that if the jockey did something wrong in a race, afterwards Fisher just wouldn’t be found. There were no after-race confrontations. One highlight of the stable tour was getting to meet Mr. Hot Stuff in person on his home turf. He was very much relaxed with the admiring crowd, posing for photos and happy to receive lots of loving attention. 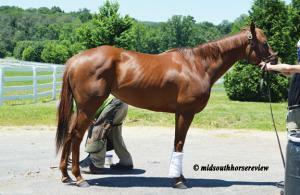 Before becoming a steeplechase horse, in 2009 Mr. Hot Stuff was third in the Santa Anita Derby, 15th in the Kentucky Derby, and eighth in the Belmont Stakes. In 2010 he was purchased by Gillian Johnston and turned over to Fisher for training. 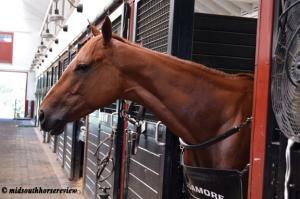 In 2011 he won the $75,000 novice stake at the Iroquois. In 2013 he won the $100,000 Grade 1 Smithwick at Saratoga. This year he finished fourth in the Iroquois at Nashville, TN. 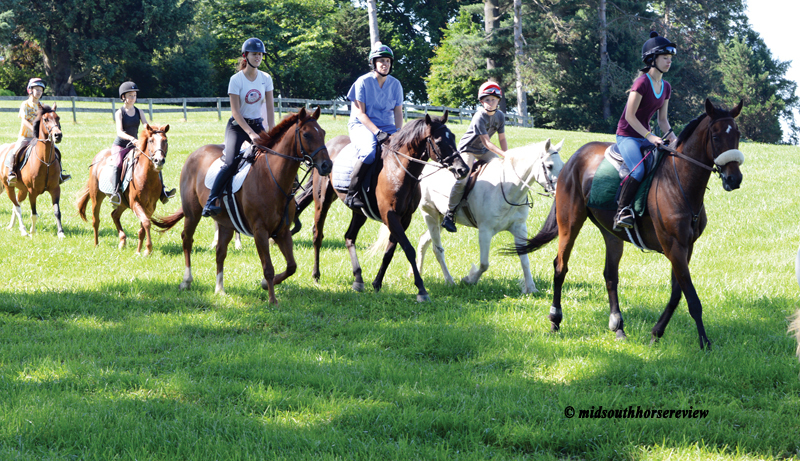 Another fun thing happening during our visit was the annual Green Spring Valley Hunt Pony Camp. 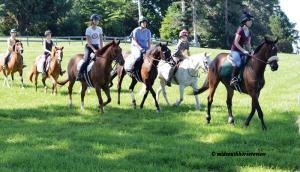 This day the pony campers came to Locust Hill to practice jumping the course in the woods, then proceed to jump the roll tops and the brush fences. 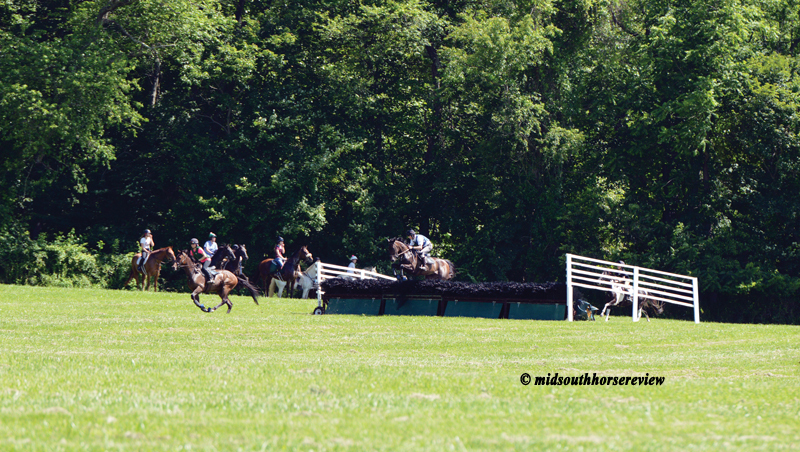 We watched a large group of riders have fun jumping the steeplechase jumps. 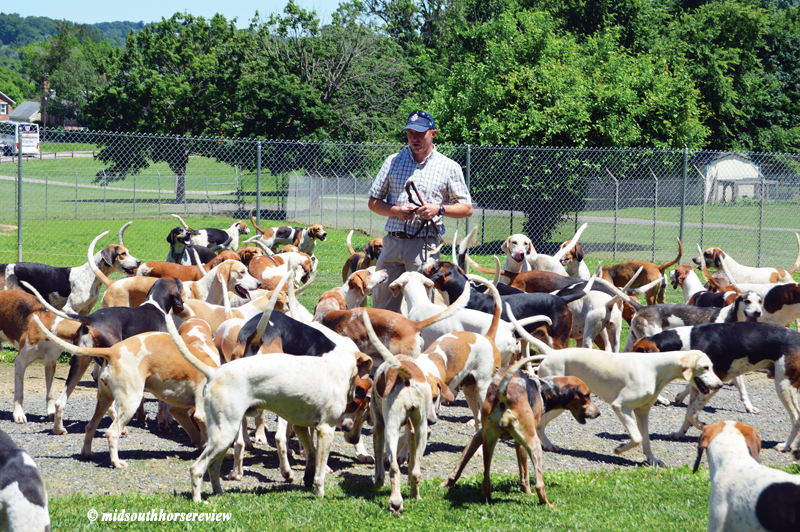 Foxhunting is a major part of Hunt Valley, and the Green Spring Valley Hounds has been a prominent fixture (pun intended) in this valley since 1892. The hunt celebrated its 125th anniversary last year (2017). Their hunt territory is about 35 square miles of open rolling countryside, with some heavily wooded sections. The east side of their hunt territory adjoins the Elkridge-Harford Hunt, and on the west and northwest side is the Howard County Iron-Bridge Hunt. 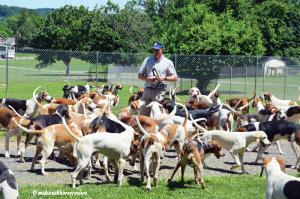 The club built a new kennel in 2012, and Huntsman Ashley Hubbard was pleased to show us the state-of-the-art kennels and 50 of his 80 foxhounds. 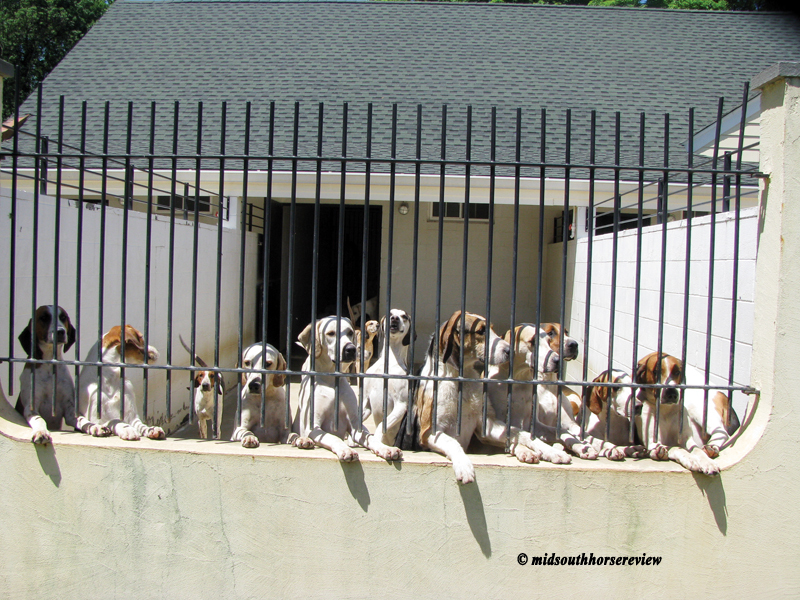 The highlight for the tour group was when Hubbard turned loose 50 hounds into the group, where there was plenty of wagging and petting for all the canines. Many people on the tour, although horse media professionals, had never had the opportunity to fox hunt or meet foxhounds up close and personal. So this was a special moment for all, foxhunters included. 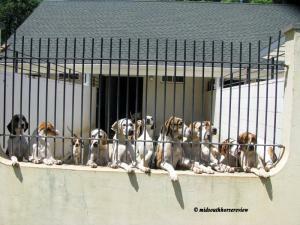 Most of the hounds in the pack are English “cross-bred” hounds, some crossed with Welsh Woolies, many crossed with American hounds (e.g., July and Penn-Marydel). 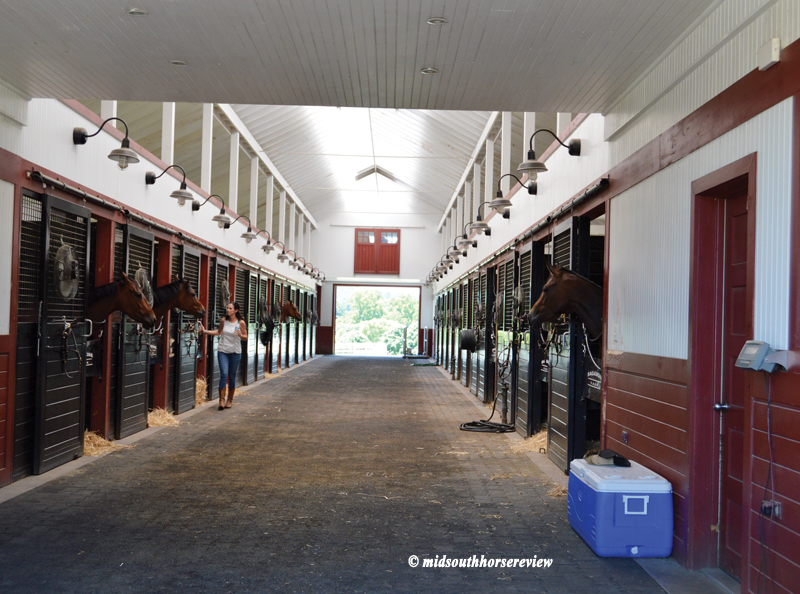 A visit to Maryland’s Horse Country wouldn’t be complete without a visit to Sagamore Farm, a Thoroughbred horse breeding farm established in 1925 by Margaret Emerson Vanderbilt, who gave it to her son Alfred G. Vanderbilt for his 21st birthday. Alfred also became the owner and president of Pimlico Race Course. Sagamore Farm’s best known racehorses were Discovery, Bed O’Roses, and Native Dancer, all of whom were inducted into the National Museum of Racing and Hall of Fame. 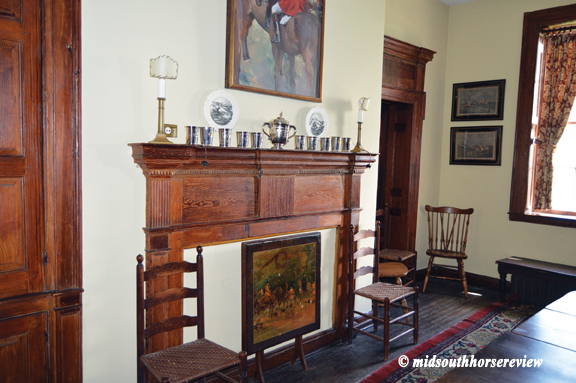 The farm, however, has had its ups and downs, being prominent with Thoroughbreds for a while, falling into disrepair, being sold, and then revitalized. In 1986 Vanderbilt sold the farm to developer James Ward, who had plans for cutting it into 5-acre lots. Egads! 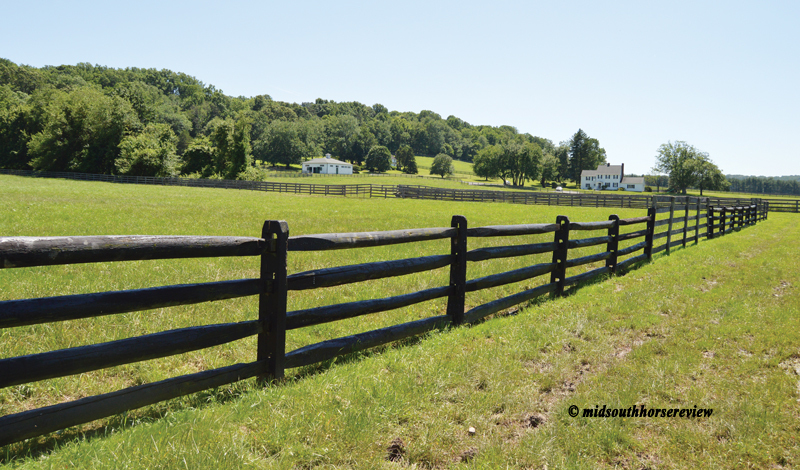 But Peter R. Fenwick, President of the Valleys Planning Council, explained how the organization worked diligently to help preserve the farm and ward off subdivision development on the historic Thoroughbred farm. The Valleys Planning Council is a non-profit organization devoted to protecting the region’s rural countryside, and Fenwick gave us a history of their work to protect this area for horses and farms. Currently, this area’s zoning is for one house per 50 acres, he said. 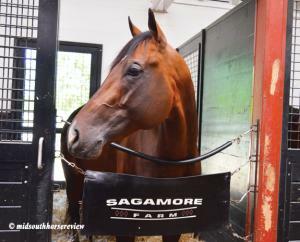 In 2007 CEO of Under Armour Kevin Plank bought Sagamore Farm with a long-term plan for major restoration. 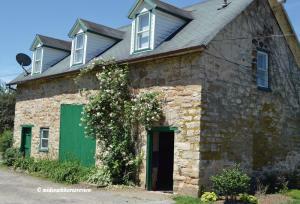 New barns have been built which are, at once, horse-health friendly and environmentally friendly. The one barn that hasn’t yet been restored is the historic 90-stall training barn with a quarter-mile interior track. The stalls in this barn are very dark with no outside windows and are just not “horse healthy,” Sagamore Director Randy Lewis explained. 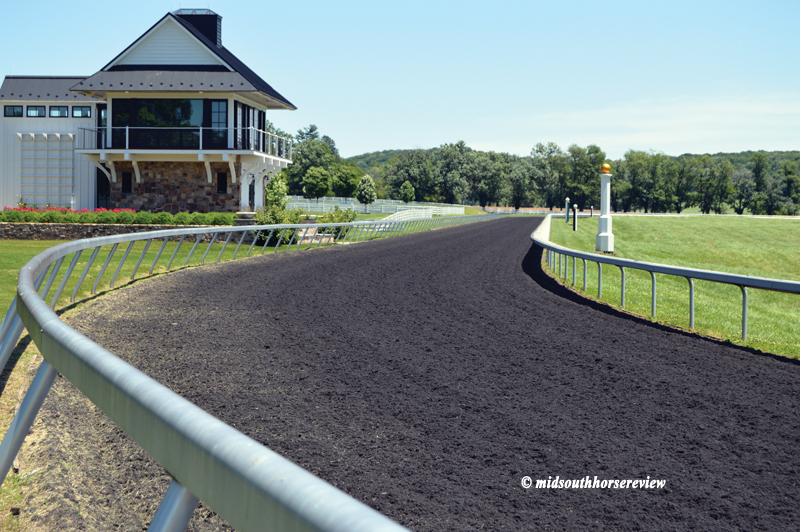 Sagamore Chief of Staff Jocelyn Brooks took us to the race track and explained the how the all-weather surface is designed and what its components include. The original track was constructed in 1926. In 2009, the ¾ mile dirt track was renovated with the Tapeta All-Weather surface, an environmentally friendly material which provides extra cushion and stability. The Tapeta surface is combined with fragments of recycled Under Armor Apparel, such as T-shirts. 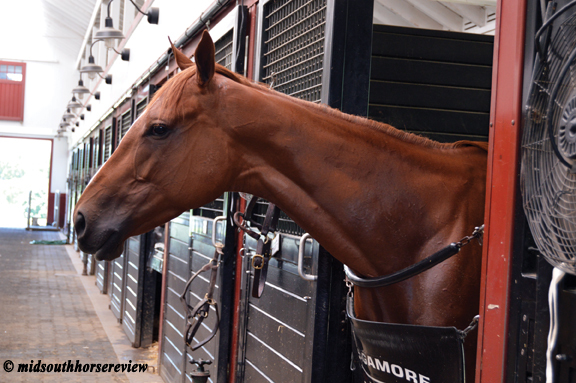 Five Sagamore Farm horses ran at Belmont Park, Laurel Park, and Churchill Downs on June 16. Among them: 4-year-old filly Chubby Star ran in Race 4 at Belmont Park, where she placed sixth. 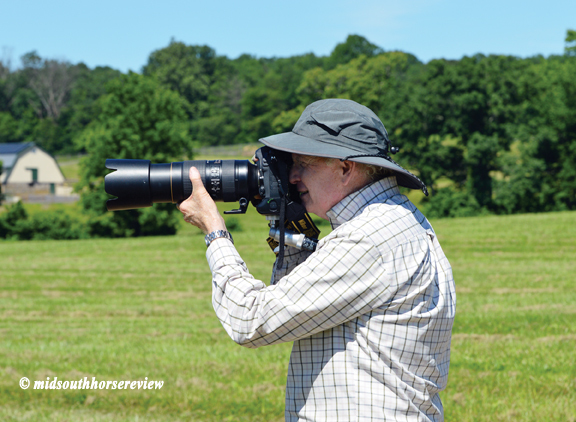 Along the tour, one of the nation’s most distinguished steeplechase photographers, Douglas Lees, mirrored our stops, taking numerous photos at each one. He has won two Eclipse Awards for photography, received three honorable mentions, and is one of only eight photographers to win the honored award more than once. In addition to photographing steeplechasing, Lees also enjoys photographing foxhunting and fly fishing. 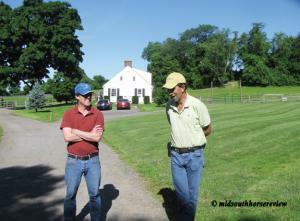 While we were at Locust Hill Farm, Lees was gracious in answering photography questions from the tour group. Read about Lees and see some of his photographs at: https://piedmontvirginian.com/a-sport-and-a-pastime-photographer-doug-lees/; https://www.vabred.org/douglas-lees-photos-of-the-international-gold-cup/. One interesting note: At every barn we visited there were plenty of barn swallows – even several nests at the kennels. 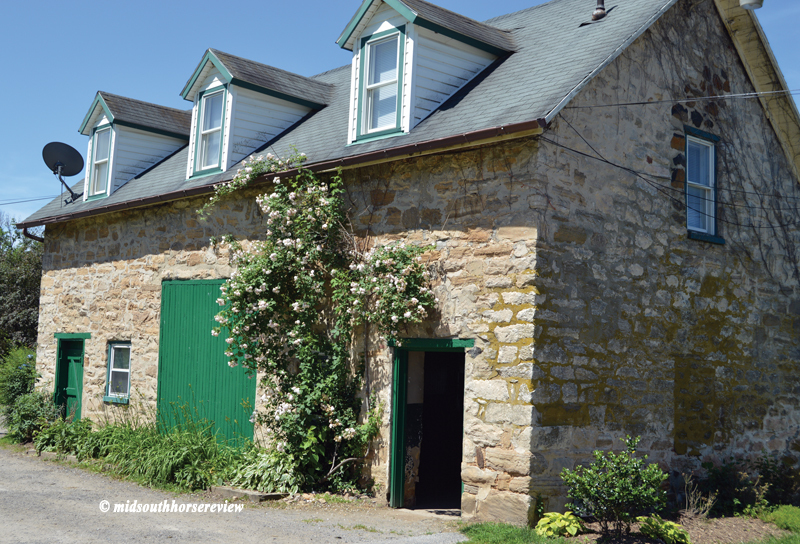 Especially at the older, un-renovated barn at Sagamore, lots of barn swallows found a delightful home throughout.